My baby girl is turning 1 soon, so I've had birthday on the brain. Then I was thinking... I don't think I have ever posted my son's first birthday cake. The caterpillar is made of chocolate cupcakes. The head I frosted yellow and the body green and blue-green. I lined them all up on a cookie sheet and added the decorations. Mike-n-Ike, licorice ropes, and M&Ms. Cute and tasty. And more importantly.... easy. You followed me, and I just had to follow you right back. Everything on your site looks amazing. I'm so glad I found you...and visa versa. Love this! 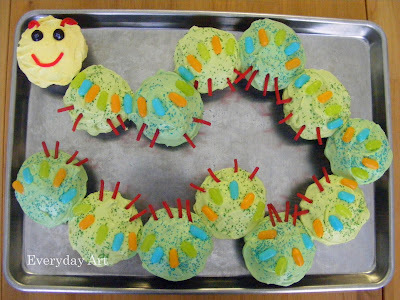 We did a Very Hungry Caterpillar Cake (meaning cupcakes) for when my youngest turned one. That is adorable ! I love it! Thanks for stopping over! Awesome cake! I love how simple it is to make, too. Thanks for the inspiration!